After Veeam Agent for Linux connects to Veeam Backup & Replication, Veeam Agent for Linux automatically starts consuming the license. If the license allows Veeam Agent for Linux to operate in both the workstation mode and server mode, Veeam Agent for Linux will operate in the server mode. You can also assign a license to Veeam Agent for Linux manually if needed. When you assign a license, you can select in which mode the licensed Veeam Agent will operate. 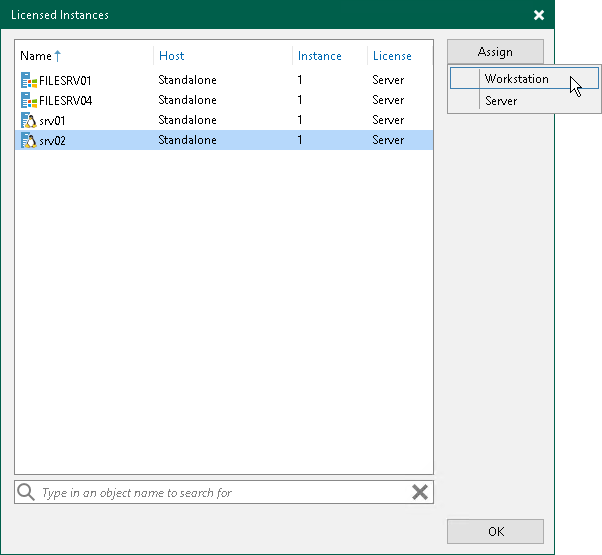 In the Licensed Instances window, select the Veeam Agent to which you want to assign the license, click Assign and select the desired functionality mode: Workstation or Server.